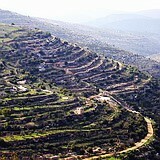 Biblical terraces in the Judean Hills south of Jerusalem- still cultivated! God calls Abraham to leave his home in Ur (Iraq today) and settle in Canaan. Bearing a faith in one god and the will to set off on a divine mission, God promises to make Abraham the father of a nation through which the world would come to know about justice, love, compassion, the holiness of life, and the divine spark implanted in every individual. Abraham, Isaac, and Jacob dwell in Beersheba until famine forces them to migrate to Egypt. 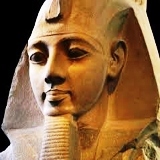 Joseph, viceroy of Egypt, settles them in Goshen- grazing area in the eastern Nile delta. After some 350 years in Egypt, at time of Ramses II, Moses leads the Israelite slaves out. They receive the Ten Commandments and Torah at Mt. Sinai, and after 40 years in the Sinai desert wilderness under the leadership of Moses, they cross the Jordan River and enter the Promised Land of Canaan under Joshua. The three Jewish pilgrimage festivals of Passover, Shavuot (Pentecost), and Sukkot (Tabernacles) commemorate the event. 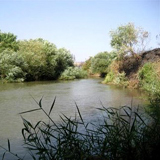 After 40 years of wandering, the Israelites reach Moab (central Jordan today) and the Jordan River. Moses looks out over the Promised Land from Mt. Nebo and dies. Joshua, the newly appointed leader leads the Israelites in conquest of Jericho and Canaan, renews the covenant, and portions out land to each tribe with the exception of Levi who were to live among the people as teachers. In transition from a nomadic way of life to a sedentary one as farmers and craftsmen, the Israelites are ruled by a Council of Elders & Judges- charismatic leader such as Gideon and Deborah who would unite the people in times of national crisis. Due to the warring Philistines, the people clamor for a king to unite them. In 1020 BC the Jewish monarchy is established when the prophet Samuel anoints Saul, from the tribe of Benjamin, as king of Israel. King Saul dies in battle against Philistines on Mt. Gilboa. The bodies of Saul and his sons are hung by the Philistines on the walls of Beth Shean as warning to the Israelites. David’s eulogy of Saul “Oh how the mighty have fallen!” is one of the beautiful pieces in biblical literature. David then becomes king of Israel (1004-965 BCE) ruling from Hebron for seven years then moves the capital to Jerusalem after defeating the Jebusites. Brings security to Israel and expands the borders to their maximum. King David is succeeded by Solomon through Bathsheba as king over a united Israel (965-930 BC). In 960 BC Solomon builds the First Temple which becomes the national and spiritual center of the Jewish people and develops international political and trade relations, including Africa and Queen of Sheba. After Solomon’s death in 930 BC, the kingdom is divided into the northern kingdom of Israel and the southern kingdom of Judah.Ahab son of Omri, was king over the northern kingdom of Israel for 19 year (871-852 BC). He married the wicked princess Jezebeel who tried to introduce Baal worship. It was during this period that Elijah was active and initiated the famous show down on Mount Carmel. In 724-720 BC the Assyrians under Shalmaneser V & Sargon II complete the capture of the northern kingdom of Israel, destroy the capital Samaria, and exile the Jewish people (Ten Lost Tribes). 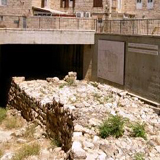 Hezekiah (715-686 BC), king of the southern kingdom of Judah, rebuilds the walls and digs a water tunnel to direct water from the Shiloach (Siloam) spring into the city in preparation for Assyrian attack which followed under Sennacherib (701 BC). This is the period of the prophet Isaiah. He ministry lasted some 60 years and began towards the end of Uzziah’s reign (c. 783-742 BC), continued under Jotham (742-735 BC), Ahaz (735-715 BC), Hezekiah (715-686 BC), and perhaps in to the reign of Manasseh (686-642 BC). The kingdom of Judah, which continued to be ruled by the Davidic line survived for another 150 years. Jeremiah was called to prophecy at the end of this period – in the thirteenth year of Josiah (640-609 BC) who introduced a religious reform. Jeremiah’s ministry continued into the reign of of Jehoahaz son of Josiah (609 BC), Jehoiakim son of Josiah (609-597 BC), Jehoiachin son of Jehoiakim (597 BC), and Zedekiah son of Josiah (597-586 BC). 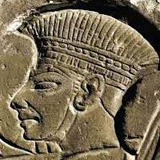 In 598 BC king Jehoiakim, son of Josiah, was killed in a revolt against Babylon. In 597 BC his son Jehoiachin, who managed to rule Judah for only a few months was exiled to Babylon along with 3000 upper class Jews, including Ezekiel, age 25, who was a kohen (priest). Ezekiel had his Vision of the Dry Bones in Tel Aviv, on the banks of the Chebar river. Zedekiah, brother of Jehoiakim, was then appointed as king but revolted again some 10 years later. 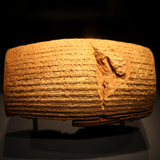 Following the exile of Jehoiachin in 597 BCE, Nebuchadnezzar II appointed Zedekiah as king. He entered into revolt with Egypt, and in Jan. 589 BCE Nebuchadnezzar laid siege to Jerusalem for about 18 months. Jeremiah prophesied that Jerusalem would be destroyed by the Babylonians due to the sins of the people. He was arrested by Zedekiah’s officials, thrown into a cistern to die, and rescued by the Cushite before sinking in the mud. In 586 BC Jerusalem was destroyed, the Temple burned, and the Jews exiled. This is reflected in Psalms 137:5-6, “By the rivers of Babylon there we wept for thee Zion”. King Zedekiah fled with supporters, was captured in the Plain of Jericho, led away to Rebla (headquarters of the Babylonian army, in Syria today), witnessed the killing of his sons, blinded, and imprisoned in Babylon until his death. Jeremiah was released by the Babylonians and accompanied Gedaliah, appointed governor, to Mizpah in Benjamin. Gedaliah was assassinated, and replaced by Johanan. The latter fled to Egypt, taking Jeremiah and his servant / scribe Baruch with him. Jeremiah lived out the rest of his life there (place of death unknown). It was during the First Temple Period that the prophets Elijah, Isaiah, and Jeremiah, as spiritual leaders, struggled to uphold the universal Torah values of love, justice, compassion and console the people in times of national difficulty. In Isaiah 1:17 we read, “Learn to do good, devote yourselves to justice, relieve the oppressed, uphold the rights of the orphan; defend the cause of the widow”. Cyrus the Persian defeats the Babylonian empire and in a special royal edict encourages the Jews to return to Judea and rebuild the Temple: “This is what Cyrus king of Persia says: The LORD, the God of heaven, has given me all the kingdoms of the earth and he has appointed me to build a temple for him at Jerusalem in Judah. Anyone of his people among you-may his God be with him, and let him go up to Jerusalem in Judah and build the temple of the LORD , the God of Israel, the God who is in Jerusalem” (Ezra 1:2-3). The response is overwhelming and in 538 BC the first wave set out: “The whole company numbered 42,360: The priests, the Levites, the singers, the gatekeepers and the temple servants settled in their own towns, along with some of the other people, and the rest of the Israelites settled in their towns.” (Ezra 2:64,70). 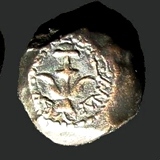 At the head as governor of the Return to Zion was Sheshbazzar (probably Shenazzar son of Jehoiakim in 1Chron. 3:18) to whom Cyrus returned the holy vessels of the Temple (Ezra 1:7-8). At a later stage Zerubabel, also governor (rosh golah), was involved (Haggai 1:1). Some hold that they are the same person. In 515 BC, the 6th year of the reign of Darius the rebuilding of the Temple was completed. It was however during the reign of Artaxerxes that two great Jewish leaders come to Jerusalem from Babylon carrying official authority from the king to introduce widespread religious and social reforms. The first to come was the great religious leader Ezra the Scribe. He arrives in Jerusalem in 458 BC at the head of 1746 Jews and with official authority to introduce religious reforms (Ez.7:21). One of the first things Ezra does is to outlaw intermarriage which was very widespread and threatening the future of the Jewish people (Ez. 10). In 445 BC (13 years after arrival of Ezra), Nehemiah is appointed governor of Jerusalem by the Persian king Artaxerxes. Nehemiah takes on the task of rebuilding of the walls of Jerusalem. He also introduces socio-economic reforms such as freeing those Jews who had become indentured servants due to personal debt, and returns them the land they had lost (Nehemiah 5:11). Nehemiah also strengthens Jewish tradition. The Persian empire fell to Alexander the Great in 332 BC who spread Hellenistic culture throughout Asia. In 167 BC the Greek Seleucid ruler Antiochas IV Epiphanes desecrated the Temple, banned Jewish tradition including circumcision, Sabbath, Torah study, and imposed Greek pagan rituals in the Temple where an idol of Zeus was placed. Mattathias the Hasmonean (died 166 BC), a kohen – priest – from the village of Modi’in and his sons (Maccabees) led the Jewish people in an uprising. 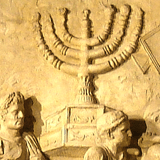 In 164 BC the Temple was recaptured, cleansed of Hellenist influence, and rededicated (Hannukah festival) by Judah Maccabee, a military genius and successor to his father Mattathias. Jewish independence was regained. Judah Maccabee died in battle against Seleucids at Elasa (160 BC), and was succeeded by his brother Jonathan (160-143 BC), youngest of the five sons of Mattathias. Considered no less courageous than Judah, continuing the struggle for independence. In 153 BC became High Priest and officiated for the 1st time, made a treaty with the Roman Republic, captured and executed by the Seleucid general Diodotus Tryphon. Simon (142-135 BC), 2nd son of Mattathias followed as both High Priest & Prince (Nasi) of Judea, recognized by the Roman Senate in 139 BC). Assassinated in 135 BCE and succeed by his 3rd son John Hyrcanus I (134-104 BC), nephew of Judah Maccabee, who was designated High Priest but also wielding secular power but in his will separated the two. Succeeded by his elder son Judah Aristobulus I (104-103 BC), the first Jewish ruler to give himself the title “King” since First Temple times. Next was Alexander Janneus (103-76 BC), brother of Aristobulus I, under whom the Jewish kingdom reached its greatest extent. The Maccabean king Alexander Janneus died in 76 BC and was succeeded by his wife queen Salome Alexandra (76-66 BC). When John Hyrcanus II (High Priest 76-66 BC), Salome’s eldest son, succeeded to the throne in 67 BC, his brother, Aristobolus II, backed by the Sadducees, immediately led a revolt against him. Both sought the help of Pompey, the greatest Roman general of his day, who had advanced into Syria. The Roman sided with Hyrcanus, the weaker of the two brothers, and the easier to control. Pompey advanced on Jerusalem and Aristobolus retreated to the Temple. It fell after a siege of three month in 63 BC. Judea became puppet of Rome and John Hyrcanus II was allowed to rule a much reduced realm, both as High Priest and king (63-40 BC). His chief minister was Antipater II, Herod’s father, who was raised as a Jew after the forced conversion of the Edomites under Hyrcanus II. Enjoyed reading Zack Shavin’s short history of Israel in Bible Times? Come to Israel and experience the real thing! 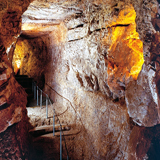 For more information contact Zack Shavin, veteran guide & biblical archaeologist at Land of Israel Tours.